South Korean President Moon Jae-in and North Korean leader Kim Jong Un clinked glasses in an official welcoming dinner, less than an hour after reaching their historic agreement on the denuclearization of the Korean Peninsula. Dozens of officials and famous performers from North and South Korea joined the leaders for the banquet held in the South's side of the Panmunjom truce village. The first ladies of the two Koreas met each other for the first time briefly before the banquet. Other attendees include some 26 people from the North, including Kim and his wife, high-ranking regime officials, and pop star Hyon Song-wol, who led a cultural delegation to the South during the Pyeongchang Winter Olympics. The South Korean delegation, including Moon and first lady Kim Jung-sook, ruling party lawmakers and musicians Cho Yong-pil and Yoon Do-hyun, adds up to 34, said Seoul's presidential spokesman Kim Eui-kyeom. The first couples greeted the guests at the entrance to the banquet room. 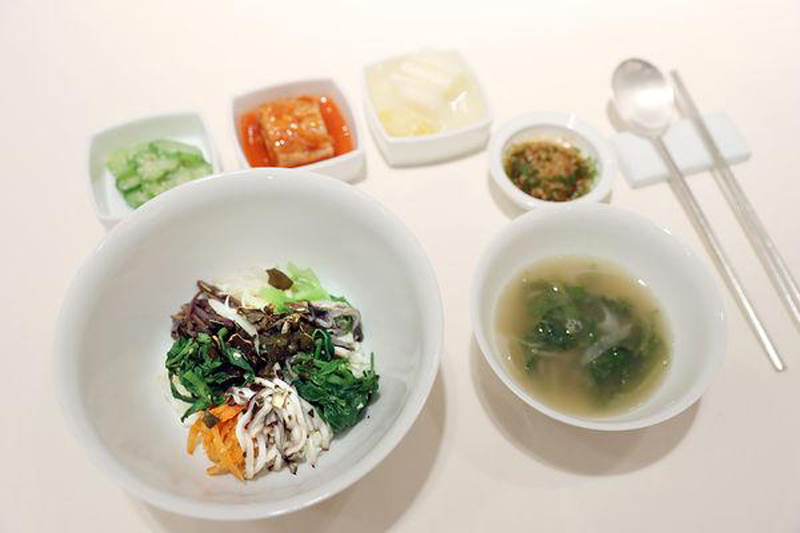 One of the standout dishes for the banquet is authentic Pyongyang naengmyeon, or cold buckwheat noodles, prepared by a decorated chef from North Korea's famous Okryugwan restaurant. The noodle machine was delivered to Panmunjom earlier to produce fresh noodles for the leaders. Kim said before the summit that he hoped Moon would enjoy the signature dish. The menu also includes steamed fish and rice from the hometowns of former South Korean Presidents Kim Dae-jung and Roh Moo-hyun, who held summits with former North Korean leader Kim Jong Il in 2000 and 2007. The South also prepared a Korean interpretation of rosti, using potatoes from the South's Gangwon province topped with cheese. The Swiss-inspired dish gives a nod to the North Korean leader's school years in Switzerland. Seoul also presented a set of desserts, called the "Memories of Swiss," which include Swiss chocolates, macaroons and cheesecake. Mango mousse decorated with a blue map of a unified Korean Peninsula was also served as dessert. The historic meeting between the two Korean leaders is the first to take place in more than a decade, after liberal South Korean leaders Kim Dae-jung and Roh Moo-hyun met late North Korean dictator Kim Jong Il. Moon is due to visit Pyongyang this autumn, as part of the agreement reached by the two leaders.